Clay palette knife is one of the essential tools for metal clay work. You'll use it to make, stir and apply paste, to move work from place to place, cut off chunks of clay, etc. Some call this a spatula. Polished stainless steel blade. The blade is very thin and flexible. Series 1066E Ecolse Painting Knives have a steel blade in a hardwood handle. Terbuat dari "NON-stick" plastic, sehingga clay tidak menempel, mudah di bersihkan. Panjang alat : kira kira 115mm. Panjang alat : kira kira 165mm. Stainless steel tool won't rust, and are easy to keep clean. This double ended design tool offers a wide variety of texturing: a blunt needle tool on one end and a curved burnisher on the other. It is a "Must-have" tool like spatulas for clay craft. 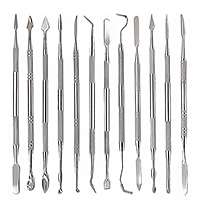 Set of 12 different stainless steel tools with 14 different carving and spatula shapes. Stiff blades sculpt and shape wax, clay, plaster and more. Fill and form casting masters and cast resin parts. Shape and create details on models; plus dozens of other applications. Include bag for easy storage. Fluorine Roll Bar 2mm Fluorine Roll Bar has a 2mm blunt point end for small scale sculpting, punching holes, shaping, refining and smoothing clay. It is a useful for making frilled flower petals. The fluorine clay tool is easy to keep clean. Plastic Rod 2pieces set Plastic craft rod is a set of 2 clay tools with a round tip and a pentagon one. The light and durable tools are useful for making small and thin parts like frilled flower petals, leaves, and fake sweets. Basic tool set for cutting, texturing, and fine detailing the clay. Set of 3 includes mallet, rasp and chisel. # Mallet for creating indentations, rounding textures, concaving surfaces, lining textures and clay cutting. # Rasp for texturing, making patterns, creating lines, and cutting. # Chisel for making small holes, dots, fine detail, surface finishing and color blend. Four hardwood modeling tools that are perfect for working with and shaping polymer clay or any other clay (metal clay, resin clay etc). Each has its own distinctive shape to satisfy a variety of modeling needs. Ujungnya terbuat dari soft silicone, sehingga dapat menghasilkan efek sculpting yang halus. Mudah di bersihkan dengan air biasa. Cup Chisel, Taper Point, Flat Chisel, Cup Round, and Angle Chisel. Double end; Ujung yang satu terbuat dari soft silicone, sehingga dapat menghasilkan efek sculpting yang halus, ujung yang lain adalah "wire sculpting tool". A set of 3 double ended tools, each used for a wide range of projects and techniques. This tool kit includes a loop tool, needle tool, potter's rib, ribbon tool, sponge, steel scraper, wire clay cutter and wood modeling tool. May be used with any type of clay. Great for students ! Alat ini dipakai untuk proses detail pada waktu "sculpting" pada clay dll. Bentuk kawatnya macam macam sesuai kebutuhan. These tools actually carve clay or wax rather than scraping it. 1 set has 4 shapes with 2 sizes of one shape on each tool. Each loop has one cutting edge. Stainless steel construction, 178mm long. 1 set has 2 shapes with 2 sizes of one shape on each tool. Each end has a SCOOP shape, popular used in pottery or wax carving. Stainless steel construction, 135mm long.